Help SEHN start 2015 with strength! At the Women’s Congress for Future Generations, legendary scholar, author and activist Riane Eisler called for a global shift to economic practices and policies that value caring for other beings and for the earth. Her idea – that the real “wealth of nations” is not simply financial, but consists of the contributions of people to each other and to nature – illuminates SEHN's goal in convening the Women's Congress. We invite you to make your contribution to the work of cultivating and protecting our real, collective wealth – in service of future generations. 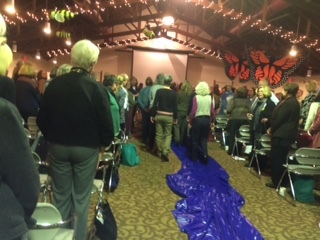 Nearly 500 Congress participants gathered in Minnesota this November to delve into the question: how do we shift from a culture based on dominance and exploitation of resources, to one focused on long-term collective well-being, partnership, and a relational approach to the community of life? We explored the tenets of the Owl Economy, a wisdom-based approach to economics calling for a recognition that the Earth is the source of our life and our economic activity. 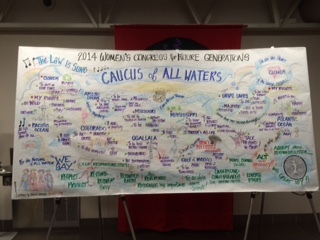 We offered participants a template for action, Heartland & Headwaters, to support the emerging grassroots movement of women organizing and innovating for future generations as a result of the Congress. And out of our Caucus of All Waters, we developed the Declaration of Rights of All Waters, articulating the innately-held rights of the oceans, lakes, rivers, aquifers, and clouds, as well as the related responsibilities of humans to protect these waters. Throughout the Congress, we wove music and the arts into the proceedings. With song, we invoked the living rights of all nature. With music, we grieved the earth’s losses and celebrated our power to make change. We danced and sang the new forms of law and policy into being. 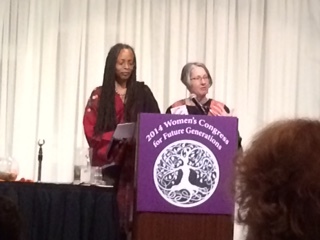 We at SEHN are honored and inspired to steward this critical work of uniting women to demand systems-level change. We invite you to stand with us and offer your support for this critical, narrative-shifting work of our time. We are steadfastly committed to calling forth a legal system grounded in guardianship and care for future generations. At the cusp of 2015, we are exploring innovative partnerships and possibilities for a next women’s gathering – which we’ll share with you in the coming weeks and months. Thank you for your support as we continue to work together to ensure that future generations can thrive on this beautiful earth.